The business of rhythm and music games is sort of like the real music industry. Classy little cult hits like PaRappa The Rapper, Vib Ribbon and Ouendan were once the sole territory of the especially hip. You could boast about your Taiko No Tatsujin skills to your rhythm-less pals, or quirk a brow at your uncool peers as you casually hit "play" on your obscure DDR songs during a house party. Then Guitar Hero and Rock Band happened. Music games are officially big business now, and everyone and their mother (literally) wants in. Next thing you know, you're boycotting the Grammys and defiantly tattooing the word "sellout" on your forehead. 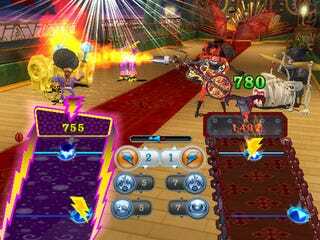 Battle of the Bands for Wii is THQ's entry into the rock music arms race—but is it a worthy innovator on the scene, or just a trendwhore leaping onto the bandwagon? Awesome Musical Mashups: Battle of the Bands is a "musical combat" game, meaning two bands from different genres square off to try and hit the right notes in the same song. Because of the range of musical genres to pick from—rock, country, hip hop, marching band and Latin—players have the opportunity to hear each of the game's 30 tracks covered in any one of these five musical styles. The quality of the covers is really thorough—right down to Spanish-language lyrics in the Latin versions, a lovely touch. Going up against a friend or the CPU, the song you're playing will periodically switch back and forth from your version to your opponent's, which feels frenetic, silly and fun. Decent Song List: This is always a matter of opinion, of course - after all, many rhythm game connoisseurs prefer cool original songs that play well to any popular song. In this case, songs like "Insane in the Brain," "Blitzkrieg Bop" and "Mama Said Knock You Out," for example, were all clearly chosen to work well with each of the different cover band styles, and it's fun to hear new takes on solid popular music. The Controls: Are you tired of waggle for its own sake yet? The game's control scheme, which asks you to jerk the Wii remote left, right or down (depending on the direction indicated) in time with the music, doesn't serve the genre and becomes boring after just a few tunes. Moreover, the Wii remote sensitivity doesn't feel quite right here - for a keep-the-beat game, being just a little bit off is a total dealbreaker. The "Battle" Thing: You don't just keep the beat in Battle of the Bands. Chaining accurate notes fires a special weapon at the enemy, who's also firing at you. You can push the Wii's B button to block, and you and your opponent only gain points if you hit one another. This method of scoring, however, feels tacked on, and distracts from the music. The Aesthetics: Oh my goodness, it's hard on the eyes. If a froth-mouthed fanboy wants ammunition for his "glorified GameCube" argument against the Wii, he would be well-served to screencap this game. It's almost inexcusably low-fi. The Characters: Guitar Hero III's goofy character designs took some knocks in the court of public opinion for their Muppet-ish proportions and stylized looks. Battle of the Bands' characters are even more exaggeratedly cartoonish - but that's less of a problem than the fact that some points of view might find them borderline offensive. The country bands are white trash hicks, the hip hop groups are thuggish and cash-obsessed, and the dialogue that opposing bands exchange before they fight contains humor that plenty of people will just find tasteless. The Clone Factor: Imagine this: two scrolling fretboards with dots on them oppose one another on the screen. No, it's not the market leader, it's Battle of the Bands! True, that's what a guitar looks like, and a band game is bound to have guitars. But the game board is perhaps the most blatant example of the game's knocked-off, "me too" vibe. There are a few reasons to love rhythm and music games - the joy boost you get from feeling as if you're actually playing, like with Guitar Hero or Rock Band; endearing periphery, a là Gitaroo Man, or utterly satisfying beat-keeping, as in Elite Beat Agents. Battle of the Bands lacks any of these points in its favor, unfortunately. It's a shame, because the music is quite well-done and the core concept is encouragingly creative. The simple gameplay might be more enjoyable to younger kids or casual gamers who might be less inclined to mind the imperfections—but the crude dialogue would likely be a turnoff for casual fun-seekers, and it's not really suitable for young ones. Battle of the Bands was developed by Planet Moon, published by THQ and was released on April 21. Retails for $49.99. Available on Wii. Played single player story mode to completion, and a few levels of local two-player battle.